On a crisp Winter evening, a friend and I ventured to the South side of the city (across the river) to a lovely venue off bustling Chapel street. The venue is called “Chapel off Chapel” and is the hub for the Melbourne Cabaret Festival which is currently running. 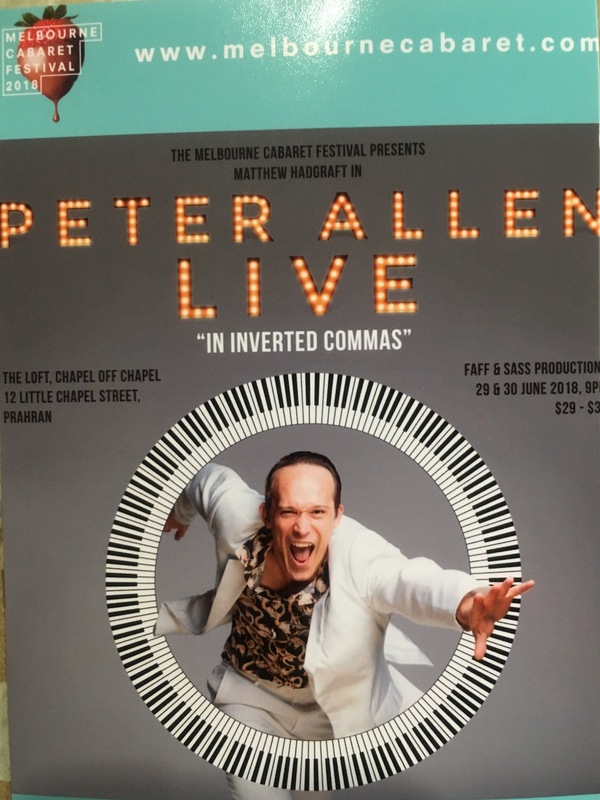 The foyer was filled with different groups of people waiting to see various shows – Peter Allen Live “In Inverted Commas” (henceforth referred to as Peter Allen Live) being one of them. Prior to the performance, audience members were treated to some impromptu show tunes by some VCE performance students, which was a nice touch. It got everyone in the mood for a musical evening (and our collective trip to “Rio”). Upon entering the theatre (with a clever ‘cabaret’ formation of seats for the audience), the stage was inhabited by a large black grand piano, with a set of sparkly maracas resting on the side. 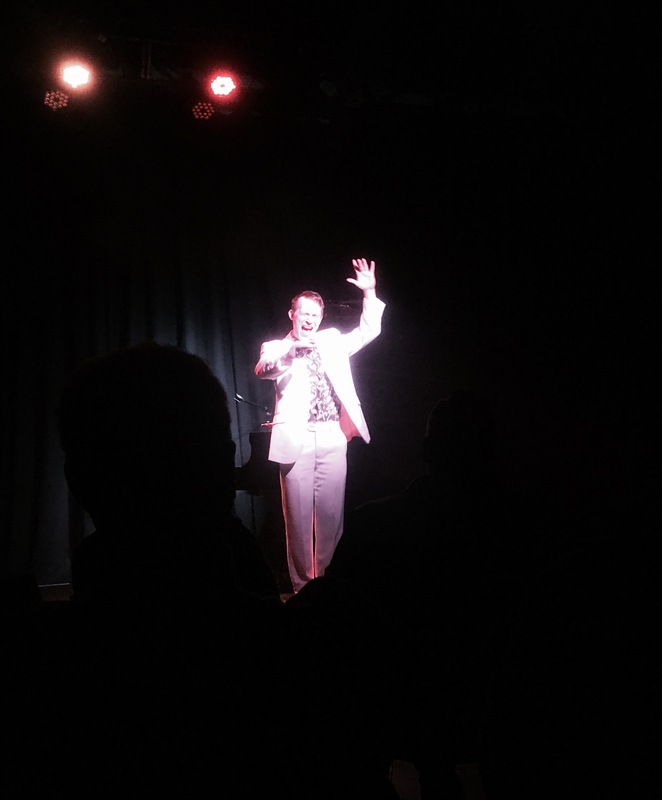 Performing as Peter Allen himself, Matthew Hadgraft bounded on stage in a striking white suit. From this moment I knew it would be an exciting trip for the audience down memory lane, but also a trip back in time to when Peter Allen was trying to ‘make it big’ in the entertainment world. Hadgraft’s talent is unmissable in this show – as the audience can see he really is playing the piano, and singing with gusto at the same time – while doing Peter Allen’s story justice. Hadgraft is not static / frozen at the piano during this show either – many times he’d finish a song and move his arms in grandiose movements or show off some retro dance moves. Hadgraft clearly has a lot of respect and admiration for Peter Allen, as during regular breaks between songs he told the audience about the life and times of Peter Allen. From relationship breakups to travel and the celebrity scene, this show was a fascinating look at aspects of Peter Allen’s personal life as much as the songs the everyone knows best. On that note (haha!) those of you with established Peter Allen favourites will not be disappointed, as the show includes many of Peter Allen’s best hits along with a few perhaps ‘lesser known’ songs. All the songs chosen contribute to the rich tapestry of Peter Allen’s life, and all have a part to play during the show. For those who are expecting the show to lack pizzazz or perhaps to be an evening of slow songs, you would be wrong! There were times where Hadgraft would select members of the audience to assist him on stage, often with hilarious results. As the show reached its crescendo towards the well known hits, members of the audience were clapping in time to songs, smiling and swaying to the music. The atmosphere in the theatre was fun and light. Testament to Hadgraft’s many talents and the joy felt by all, the show culminated in a standing ovation – a rarely seen occurrence in this society. My friend who attended the show with me knew very little about Peter Allen but he came away having a fun evening out, and even learned a thing or two! We both left the theatre with smiles on our faces, discussing “our trip to Rio” and humming the most famous Peter Allen tunes – basking in a fun evening away from all the Winter gloom. The 2018 Melbourne Magic Festival has appeared in town!